Prioritized agenda defines target/priority policy results and actions to be implemented by national/local stakeholders with U.S. Government support. The Agenda has to be solid, transparent and easy to implement, with clarity on how to achieve the results. Practitioners need to think in the context of constraints and restraints and think about the stakeholders. 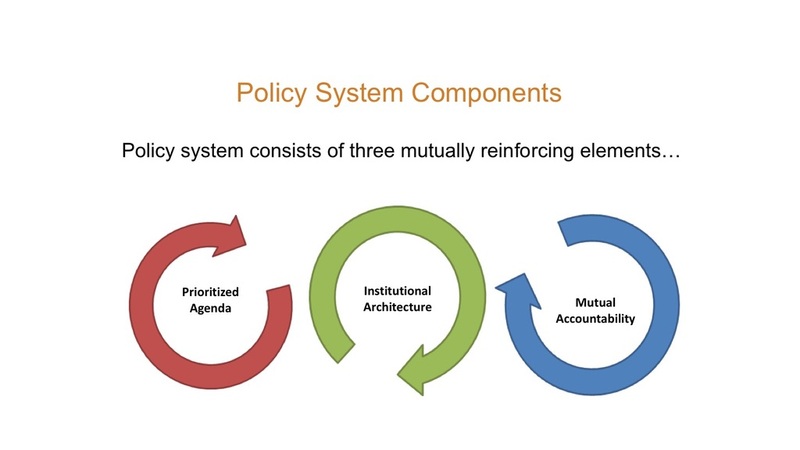 Institutional Architecture for Policy refers to the entities and process for policy formulation and implementation, including a communication process that works in both informal and formal systems. In this component there are a host of actors taking ideas forward. Practitioners need to be asking, what is the landscape to bring about the change, and what is the landscape to implement this over time? Who are the change agents and how are we investing in these people to make change over time? Mutual Accountability is a process that aims to ensure actors follow through on commitments and use resources effectively. It involves building the willingness of different institutions to be accountable to each other, where everyone is accountable for what they have agreed upon. This might be the most important element for implementing change; doing what you said you will and ideally doing it with solid monitoring and feedback mechanisms. The three areas all invest into each other; the prioritized agenda based on evidence invests in architecture; an effective institutional architecture plans and implements policies through the actions of diverse actors and invests in accountability; and in mutual accountability, actors are working together to ensure governments and stakeholders follow through on their commitments. The Food Security and Agriculture Core Course materials offer resources that provide information for the implementation of the U.S. Government's Global Food Security Strategy (GFSS) and about how USAID/BFS is working to facilitate policy change that will improve resilience and better nutrition. What do you think of when you hear “food security policy?” Feed the Future defines policy broadly to capture three inter-related policy elements.